Dates and Schedule - Contact for more info. Participants will explore the centrality of imagery in visual art and literature. 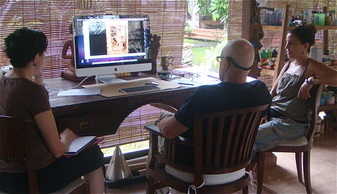 They will be guided and inspired towards images they create, discover, see, study, and analyze. The workshop is appropriate for any adult interested in investigating synchronicities between what is seen, drawn or painted and written while exploring, releasing or increasing their own creative abilities. The therapeutic aspects of creative work are also explored and discussed. Theoretical, psychological and philosophical underpinnings will be introduced and discussed throughout the workshop. To inspire participants, not only to recognize the profound relationship between visual imagery and creative writing (prose and poetry) but also to work creatively themselves within this general paradigm. To provide a sound theoretical basis for such work, especially with regards to pedagogy. To encourage participants to put what is experienced and/or learned into practice in their own professional spheres whenever applicable. Introductory overview of the topics and areas to be explored and activities to be undertaken during the workshop by Bruce Sherratt, James Penha). The empirical perception of images in the world around us—with special attention to the sensual and aesthetic aspects of Bali. The development of original imagery based on set and archetypal themes/images and dreams, personal memories, fantasies and literary-artistic interests. The art-therapeutic educational model will be emphasized. The images will be explored, developed, communicated and expressed in terms of creative writing (prose and poetry). Further exercises will take advantage of the multi- disciplinary aspects of the course to investigate ekphrastic art: literature inspired by visual art; visual art inspired by prose and poetry. Examples of excellence from current and past art and literature will be cited and discussed. Group discussions, analysis and appraisals will be an important and recurrent feature of the workshop. Samples of the participant’s own creative work done during the workshop: both visual art and written work (poetry, prose, critiques etc). These samples should be critically analyzed and assessed by the participant. Identification of the features of the workshop content they found to be most significant and instructive. A meta-cognitive think piece reflecting on the specific impact the workshop will have on the participant’s current and future professional practice. Conclusions arising from the workshop and further reflection. Bruce Sherratt and James Penha will liaise to award final grades. Participants apply directly to SUNY to register for the 3 credits.